Three items were compulsory in an Australian primary school pencil case in the late 1980s. 1) HB pencils. Generally red-coloured with a black end; 2) Erasers. Generally dingy green, with tapered ends, that smelled of fire when you scrubbed them too hard against paper; and 3) A tub of Perkins Paste, a delightfully clumpy sort-of glue, best known for its bright pink containers, white lids, and completely impractical flat stick applicator. The apex of my Perkins Paste use was in Year 3, in Mrs Simmonds' class. Mrs Simmonds always seemed to like me, giving me A marks for many of my finer social studies or English projects. Of course, such projects - generally mounted on posterboard paper - required a decent amount of Perkins pasting. Mrs Simmonds then retired, but came back for a visit when I was in Year 7. She had no recollection of me at all, and by then I had no Perkins Pasted boards filled with detailed descriptions of the planets to jog her memory. 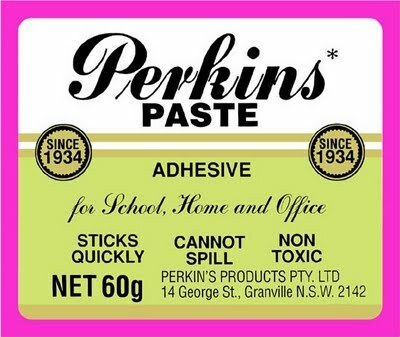 Sadly even I can no longer remember the smell of Perkins Paste, but I do recall it being far more palatable than the chemical scent of Clag, the big-bottomed gluepot that took over adhesive duties in my later primary years. Certainly daring classmates to eat Perkins Paste was a regular event, even a tad enjoyable. But you wouldn't eat Clag. No, not unless the dare involved a LOT of money. Fifty cents to a dollar, at least. My recollection is that Clag tasted better than Perkins Paste. I have no idea why I recollect that! We had Clag. And those peculiar kiddy-safe rounded-off scissors which were capable of cutting two fifths of bugger all. Clag was flour and water, nothing more. Perkins Paste smelled like cucumbers. Clag was glue of choice in my childhood, with the oddly childproof lids with the brush attatched so that it was 50/50 as to whether you'd end up wearing gobs of glue. Clag could not have had a more apt name. It even sounded like clag when it dripped onto the floor. And the inbuilt brush that was big chunky plastic bristles. I'm sure you could mix sugar in with it and make pancakes. Cam has the Perkins' Paste label on a t-shirt from Remo. Apparently Perkins' tasted better because it had almond oil in it. Clag was awful stuff that totally warped the paper you were trying to stick something to. Far too wet. Even liquid glue pens were better than that because they weren't floury water (clumps, ew). The best were Uhu sticks, because Perkins' was so viscous that you weren't so much using a brush as a trowel. I just tried to order the Perkins paste t-shirt from the store, but the website epicfailed, as did my attempt to email them about the fail. Doublefail. Hmmm. I do quite like the idea of a Perkins Paste t-shirt revival. Pity about the fail, YC. Clag is awful. Yes, you couldn't really "brush" PP onto anything, but surely that was part of the challenge! The smell is currently in the 2013 vol1 partylite catalogue. Name : black cherry! As soon as I smelt it, it took me back to my infants days at school!